I was just playing through some games from the US Championship (Kamsky currently leads with 5/6; Onischuk and Ramirez are half a point back with 3 to play), and there were 3 positions from today that looked quite interesting. This came from an Exchange French Winawer, which unlike the normal Exchange Variation, actually has some venom. From what I remember of the opening theory, if Black just tries to play some normal moves, White might well get a tiny pull. 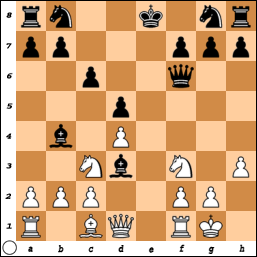 But Shulman played it quite strangely, neglecting his king’s safety to bring his Queen out to f6 and then exchange light-squared bishops. But what should White do here? Robson played the very strong, and very unnatural looking (at least to me), 9.cxd3!. It’s a very concrete move, taking full advantage of Black’s king’s position. It’s hard to believe at first, but Black is already lost!